Alex Chisholm asks what we really mean when we talk about diversity and what it means for our theatre ecology. So I said I would write something about ‘diversity’. It is a topic I’m interested in, connected to in various ways. In particular, at the moment I am dramaturg on a production of Boi Boi is Dead by Zodwa Nyoni, produced by Tiata Fahodzi, West Yorkshire Playhouse and Watford Palace Theatre. There has been a bit more public debate about diversity than usual, generated by the Creative Case conference, recent ‘white-out’ at the BAFTAs, Benedict Cumberbatch’s small scandal, and awareness in the wider world of growing inequalities. It seemed like a good moment to look at what we mean by diversity and where we, as an arts sector, are at with it. Of arts workforce of 394,500 in England 93% white, 1% mixed, 3% Asian/British Asian, 1% Black/Black British, Chinese <1%, other 1%. However, same period 70.4% Black and Minority Ethnic people participated in the arts at least once per year. They were statistically MORE likely to use a public library or access arts on line. That across arts forms 1.6% of artistic staff are disabled. 15% of working age adults have a disability. There’s a lot, lot more where this came from. This isn’t anything that we didn’t already know. But somehow seeing it laid out as cold, hard statistics, even given gaps in the research and evidence base, makes it hit harder. OK, let’s track back a bit towards what I am supposed to be talking about. Boi Boi is Dead started life in a writers’ attachment scheme I set up in 2010. I read it, liked it, gave Zodwa some notes on it. She continued to work on it while doing her MA in Writing for Performance at Leeds University. And it was sitting there not going anywhere fast. Then at the end of 2013 I submitted it and Zodwa for the Channel 4 Playwright’s in Residence scheme. And we got invited to interview (for those who haven’t been through this, it is A BIG THING. Lots apply, few are chosen). The panel was full of VERY IMPORTANT THEATRE PEOPLE like Richard Eyre and Catherine Johnson. One of the panel Indhu Rubasingham offered space at her theatre, The Tricycle, to do a reading. Lucian Msamati, then Artistic Director of Tiata Fahodzi, was invited to direct the reading. Many other people have played important role in realising this production, most notably James Brining at West Yorkshire Playhouse and Brigid Larmour at Watford Palace. But I believe that crucially it was Indhu and Lucian’s belief and desire to see this play happen that brought it into being, and that they were in positions of power to do so. Let’s talk about the play itself. Boi Boi is Dead is a family drama. It is about what happens when the man at the centre of a complex, ‘blended’ family dies and the grief, secrets and lies that start to come out. It’s about being an adult and confronting the choices you’ve made in life. It’s about being a child becoming an adult and wondering about the mess the grown-ups have made. Though it is set in Zimbabwe, it is not about Zimbabwe; it is about being human. Zodwa has written better and more movingly than I ever could about her background and identity. It is in her ‘Come To Where I’m From’ piece for Paines Plough piece which I hope will be available from their website one day. What she is not is a genre. She is a writer. She is not a ‘Black Female’ writer any more than Simon Stephens or Mike Bartlett are ‘White Male’ writers. Of course they are, but if they wrote nothing but white, male centred plays from now unto the crack of doom (they don’t, I know) that would not been seen as ‘White’ theatre, just as ‘theatre’. This play happens to be centred on a Zimbabwean family, it happens to be female led. But it is still just theatre. Back to the outrage. Why? Why are there still such vanishingly small numbers of Black, Asian, East Asian people in our arts workforce? Why are only 1% of Arts Council NPOs disabled led and a greater proportion of disabled led funding applications deemed ineligible? WHY when women make up the MAJORITY of the population and a MUCH larger majority of theatre audience and participants are we still the MINORITY of actors, directors, writers being employed? What is th problem? What ISN’T the problem is the supply side. There is no shortage in supply of talented, intelligent, ambitious, capable people of Black, Asian, Chinese, mixed, disabled, gay, lesbian, trans and all manner of intersectionalities between those groups. There is CERTAINLY no shortage of capable women (have I mentioned they’re the majority). The problem is with the demand, with the system, with the mainstream. With people like me. OK, deep breath. I am a white, upper middle class, privately, Oxbridge educated non-disabled arts worker (female but that doesn’t let me off the hook). There are a lot of people like me in the arts. Hell, there are a lot of people I went to University with currently running different bits of British theatre (and Britain but that’s for another day). This kind of discussion tends to make people like me start feeling uncomfortable but stick with me please. Yes people like me aren’t necessarily responsible for the racism, disabilism, sexism, classism, homophobia, Islamophobia of the world (some are). But we are part of the problem. Or rather it is OUR problem. If there aren’t the numbers of ‘diverse’ (for want of a better word – of course people aren’t diverse in the sense of other, they are just people) artists making productions, taking leading roles, leading and working in companies, engaged with arts then it is OUR failure. We are part of a system that keeps people out. In my work I have not infrequently been the only white person in the room. It happened during the workshops for Boi Boi is Dead. But the point is that I am NEVER the only white person in the room. Because that room, that space, the whole context of the society and the production has been created and controlled by people like me. And it is incumbent on me to remember that and often just shut the eff up to leave the space for others. Not that we can’t get past that and just be people making work in the room together. But I do have to remember the context in which we all operate and remember my perspective isn’t the only nor necessarily the right one. As I am writing this I am aware that things are in certain places, in certain ways, getting better. Fun Palaces created by the inspirational Stella Duffy and Sarah-Jane Rawlings has created a model of ‘radical engagement’; creating arts with and within communities that starts from the creativity in everyone. There are radical projects such as Eclipse’s Revolution Mix which will promote and PRODUCE a number of Black writers, creating a critical mass of talent and blowing apart the myths of Black British experience. Tara Arts and partners are producing Black Theatre Live for small to mid-scale, taking it places that usually Black led work doesn’t reach. The BBC and Channel 4 have put out pledges to diversify their workforce. Following on from Tonic Theatre’s ground breaking research into women in theatre, large scale and forward looking theatres such as Sheffield are aiming to have half of their acting company female. And I’m currently working with a consortium of large scale producing theatres that are aiming to do for integrated and disabled led theatre what Eclipse has done for Black led. Demand enables supply. But it isn’t good enough yet. This debate is often framed as us against them. But barring a revolution (where I’m one of the first up against the wall) then it has to be all of us working together to solve this. Yes of course it is people from all kinds of diverse backgrounds who should be leading and shaping change. Otherwise we just get more of the same, with a few different faces who can be made to fit. But it is everyone’s responsibility to make real change happen, especially those of us who enjoy the privileges of being white, middle class, non- disabled, straight and so on. If we are not actively part of the solution, then we become actively part of the problem. So it has to be ALL of us, not just the ‘diverse’ communities who say ‘This is not good enough’. Not good enough when an abled bodied actor takes a disabled role. 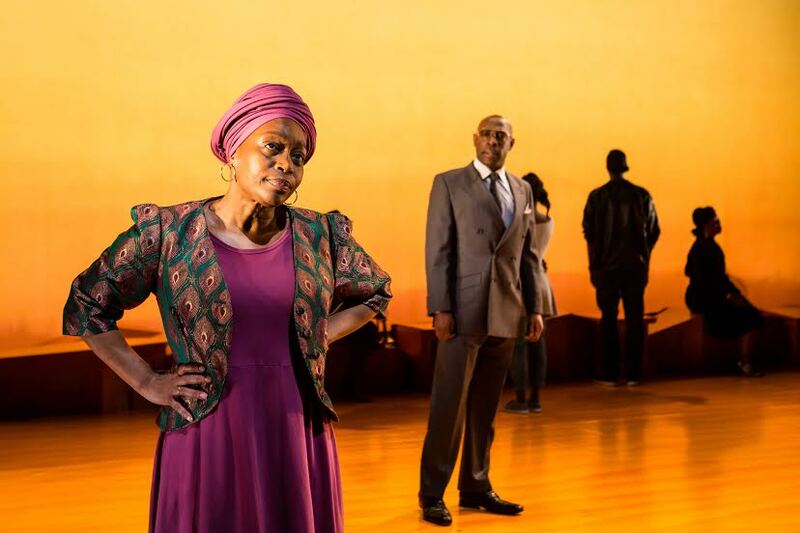 Not good enough when there are more Oxbridge educated Artistic Directors than Black ones. Not good enough when anyone feels unable to participate in, enjoy, or work in the arts because they can’t afford it or feel it isn’t for them. That we all pledge to do whatever we can, whatever is in our power, to improve things. What I am going to do? Well carry on getting Zodwa’s work on and other new artists from all backgrounds. Supporting routes into the profession for people who don’t necessarily have the money or the contacts or the opportunities. So that they are the people to run things in this country. And if we achieve proportional parity – if 14.6% of the arts production and workforce is Black and Minority Ethnic, 10 million disabled people in this country recognise themselves in 16% of TV, film, radio, theatre production – is that good enough? No, because this should be about realising the fullest extent of human potential. That isn’t done through just getting to the right statistic, as important as that is. It isn’t enough till everyone is engaged in the arts, as fully as they want to be. It’s not enough until there are people of all forms of bodies, minds, cultures and backgrounds taking leading roles in front of and behind stage and screen. So that we have all the stories, forms, crafts, experiences created, celebrated and valued equally. That Black, Asian, East Asian, Deaf, disabled, female led, whatever arts isn’t diverse. It is just the norm. And if we fail? Well we will fail, at least to begin with. That’s what we do in the arts. We fail all the time. The show isn’t as good as we want it to be. Not as many people came. It lost money. We get up, we try again, we do it better. But that isn’t failing really. Only giving up is failing. And in any case isn’t it better to ‘fail’ in the pursuit of a better, more equal world than to ‘succeed’ propping up an unjust one?